← January; a productive start! A couple of weeks ago I showed you an embroidery I’d started at our Embroiderers Guild, we’d had a mini workshop on making Rolling Landscapes. The idea is that a long, thin embroidery of a scene is attached to an old fashioned cotton reel and wound round. 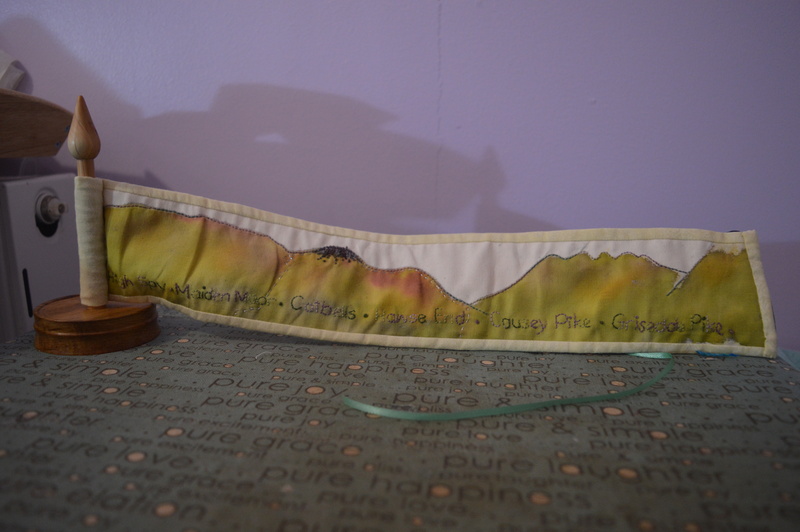 I started stitching my favourite walk, Catbells in the Lake District. 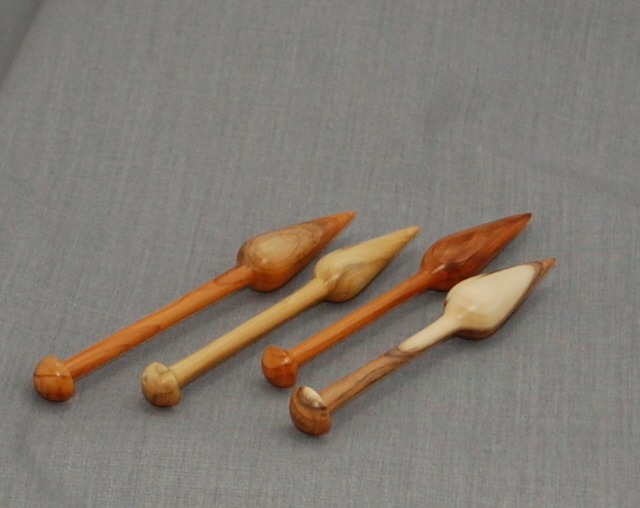 My embroidery was just over 3″ tall, I searched on the internet but couldn’t find any the right size, they were either too small or huge (like the old cotton mill bobbins) I was browsing Folksy when I came across a wood turner who made beautiful weaving bobbins, just the right length. I sent a message to see if there was any chance I could have one with a flat bottom so it would stand up. We exchanged several e-mails over the next couple of days whilst he determined what I actually wanted to do with the bobbin. 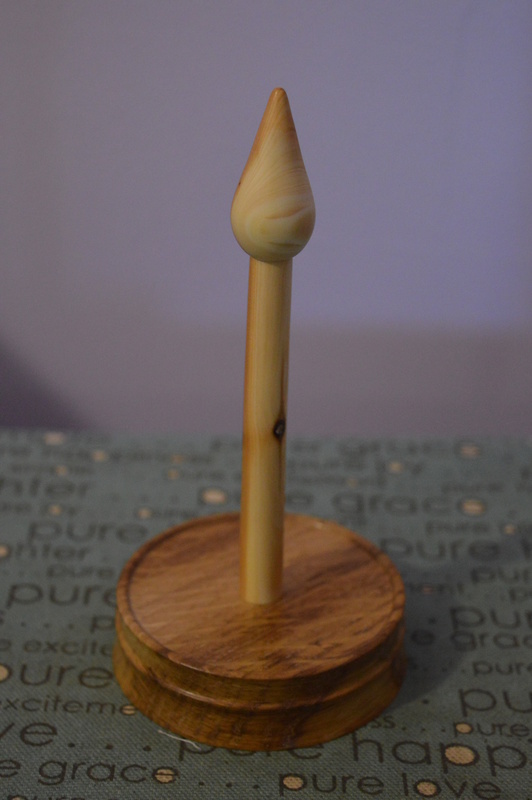 He then suggested he made one with a 3″ base in oak and a spindle with a fancy end in yew. Perfect! I paid on Saturday, he made it over the weekend and posted it to me on Monday. I did chuckle though, I knew he must be from Yorkshire as all his e-mails started with the greeting ‘Now then’, when I finally found where The Turners in the Church were based it was in Bedale in North Yorkshire, about 40 miles away! 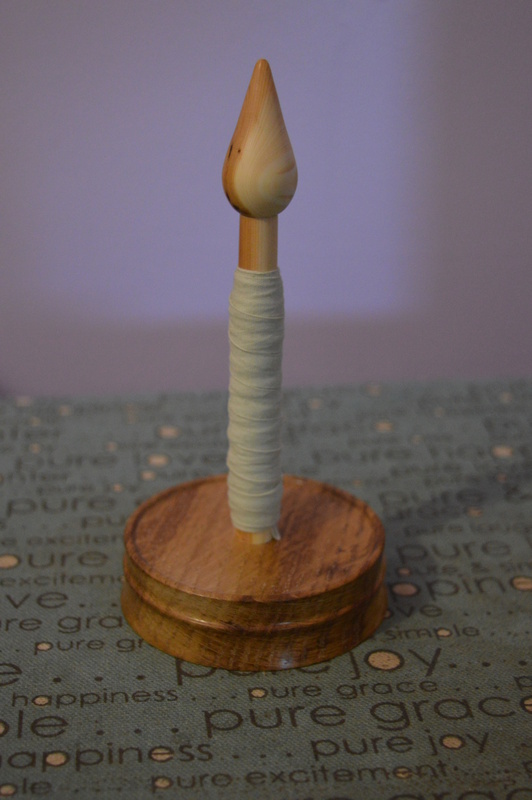 The bobbin is beautiful, it feels like silk, I love wooden things, but this is just so tactile, I love it. I needed to attach the embroidery to it pretty firmly so it wouldn’t swizzle round when I was trying to wind it up. Obviously I didn’t want to use any kind of glue on my beautiful bobbin, I came up with the idea of using a length of bias binding to tightly bind round the spindle. I went up and down about three times, the bias helped to make it firm. I hand-stitched the end down and it worked perfectly. I decided to do a little extra embroidery on the back, as I wanted the picture to be on the inside. I embroidered ‘My Favourite Walk’ at the top and my initials and the date at the bottom. I then stitched the other end to the spindle. It winds round nicely, though it does tend to crease a bit inside, I’m just pretending they are the gullies down the side of the fells! To keep it closed I attached a length of green ribbon to tie round it and a little leaf charm just to finish it off. I really like the idea of a walk on a bobbin. My friend and I do a long distance walk every year and I’m just slightly tempted to try and do one of this years walk, St Cuthbert’s Way, over 60 miles from Melrose in Scotland to Lindisfarne off the Northumberland coast. I’m linking up with Kathy’s Quilts for Slow Stitching Sunday, a weekly celebration of all things hand made. Why not click on the link and have a look what everyone else has been hand-stitching. This entry was posted in embroidery, Serendipity and tagged embroidery, Rolling Landscapes, Turners in the Church. Bookmark the permalink. Love your rolling landscape embroidery, such a great idea. 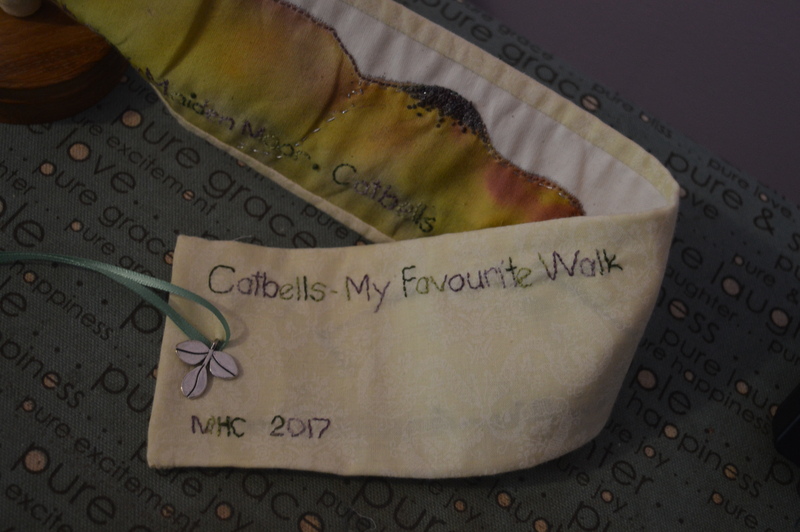 John (my husband) and I also love walking and this would make a perfect keepsake for whichever we decide is our favourite walk of the year. Thanks Lyndsey, I love the idea of having one for each year. 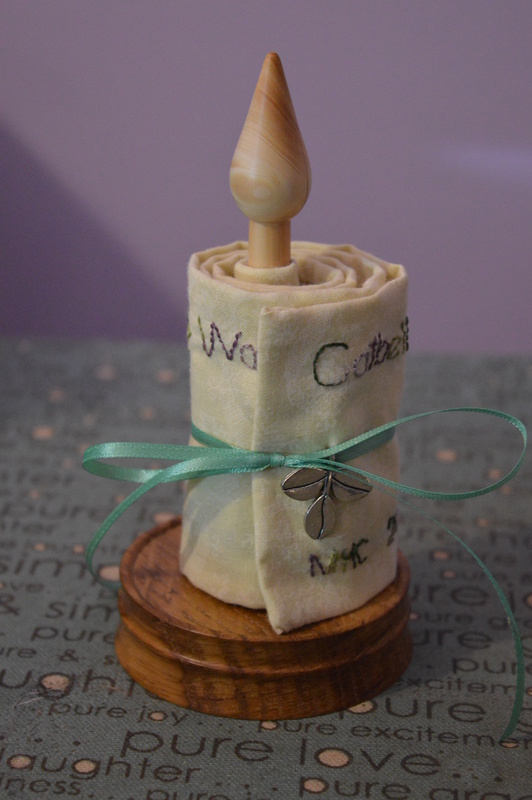 Your rolling landscape embroidery is beautiful and the wooden bobbin sets it off so well! Thank you Sarah, I’m really pleased with it. I have never seen a rolling landscape. It is a wonderful idea. Thank you for sharing with us! What a great way to take a virtual walk! What a delightful project. I’ve never seen anything like it. The bobbin idea worked out perfectly. How wonderfully this has turned out! Your bobbin is wonderful and it looks like you have found a very talented woodworker for your future endeavours! I love this…all of this…adding one more thing to my “try this soon!” list! Fabulous! I’ve never seen anything like this. Wonderful embroidery and set off so nicely by the wooden stand. I love wood. so clever and pretty 🙂 !!! This was a very interesting project and it was a pleasure to work with Margaret. Between us we have designed and created a tactile object in wood which sets off the embroidery to the best advantage. I am always open to suggestions, requests, and bespoke commissions. I hope that you’ll need further unique objects. oh how lovely! The spindle is just beautiful.